Steve Cherundolo was the US first-choice right back for the better part of three years but lost his spot in 2009. Injuries allowed Jonathan Spector the opportunity to fill-in during the 2009 Confederations Cup, and the younger Spector made the most of his opportunity, using quality performances to lock down the job for the rest of the calendar year. However, this summer the roles have been reversed. Spector, though not hurt, had a few ghastly moments during the earlier friendlies, while Cherundolo performed admirably. Yesterday, Cherundolo was given the full 90 to show he should be the starting right back when England shows up next week. FFG was there to catalog his every touch. Blue is positive, yellow neutral, and red negative. 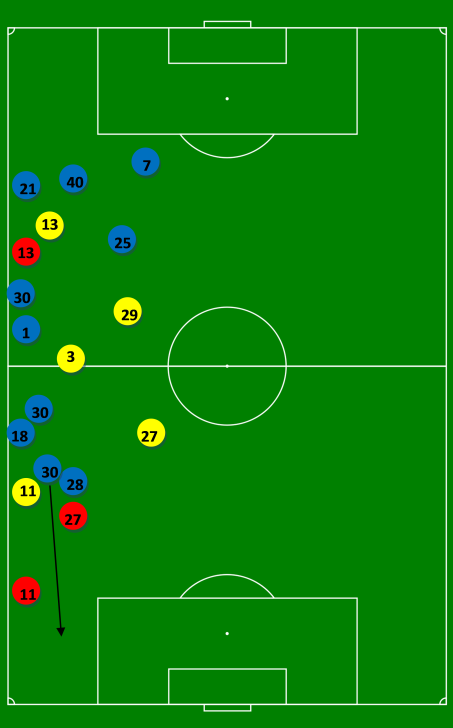 The number represents the minute in which the play occurred and an arrow indicates the player dribbled forward with the ball. Hover your mouse over the individual circles for descriptions of what Cherundolo did on a given touch (please email me, blakeowen@futbolforgringos.com, if this is not working for you). Gringos, what did you think of his performance? Did Cherundolo do enough to ensure he’s the starting right back come June 12th? That’s a neat analytic. What do you think about Buddle’s performance? Can he unseat Jozy? He looked ok, but Jozy, who is 9 years younger, is already a considerably better player than Buddle. Assuming Jozy is healthy, it’ll be interesting to see whether Buddle or Findley gets the start.